​My portfolio featuring assets I have created for game development. Welcome to my game assets portfolio! Here is where you can see some of the material I have created to hopefully get game designers to create quality material. The first kind of asset I wanted to create was a package for those looking to make block-breaking games. For many people, many are used to the classic Breakout or Taito's Arkanoid series. I wanted to offer my own piece of material just to show arrival to OpenGameArt. I had joined OpenGameArt for not too long and only recently (as of November 28, 2016) offer two assets. They are really only the same thing, only one is offered in a better resolution. It was December 5, 2016 that I unveiled the final version of my block pack with retouched graphics at a high resolution. Here is a set of 16 x 8 tiles used for making block breaking games. 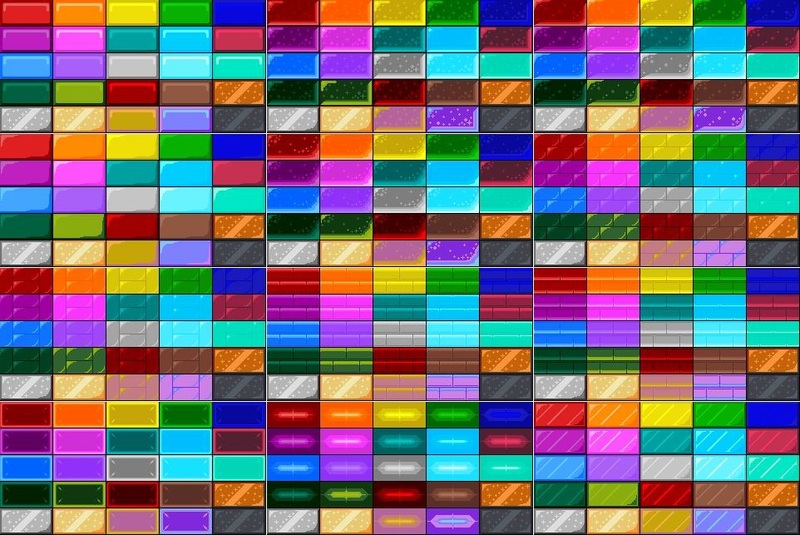 There are 12 block packs consisting of 25 different colors as part of a four-color palette. This is the same block breaking package, only at double resolution. So instead of 16 x 8 blocks, these are 32 x 16 blocks. This is the final version of my block breaking block pack, all blocks are 64 pixels wide and 32 pixels high. Do You Want These Assets? If you would like to acquire these assets, you can visit my OpenGameArt profile at: opengameart.org/users/johnm25. You can also visit the Gaming Assets portion of my JMDesigns store. If I create more gaming assets, I will be sure to share them with you all here on this page as well as in my other online content.